The LPGA Amateur Golf Association exists to connect women to learn, play and enjoy golf for business and for fun. Since its inception in 1991, the LPGA Amateur Golf Association has served as a portal to golf and touched the lives of thousands of women. LPGA Amateur Golf Association has Chapters throughout the United States, along with international Chapters in Canada, South Africa, Bermuda, Ireland and Italy. 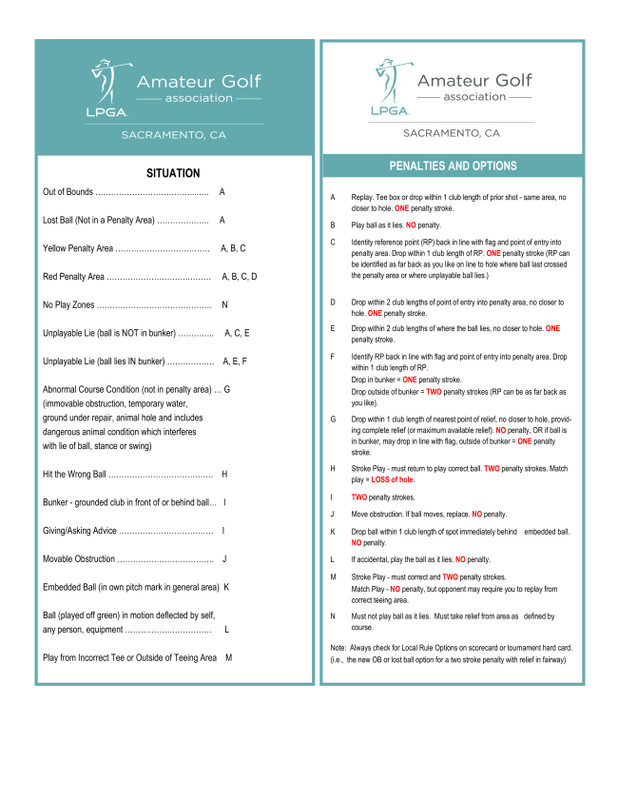 The LPGA Amateur Golf Association Sacramento Chapter was established in 1993 and is your best place to get involved, get connected and to have fun with the game of golf. The LPGA Amateur Golf Association Sacramento Chapter membership reflects a cross-section of working women in various industries in the Greater Sacramento area, including: financial services, legal, real estate, media and publishing, advertising, healthcare, information technology, accounting, retail, government and education. Many of our members are business owners, corporate executives, professionals, or entrepreneurs. And we do have a number of retired women as well! However, all of us share a common link - GOLF. Our Board is comprised of a diverse group of energetic women leaders including our President and Directors, and fantastic supporting Committee Chairs and enthusiastic committee volunteers. Typically during our golf season, on a monthly basis, you'll find an opportunity for at least one Golf Event, Weekly League Play at various locations, one Social Event, one Golf Education Event, and one evening weekly (usually two nights a week) 9-hole Girlfriend Golf Event. We host Socials and annually, we host our Kickoff Event in February, enjoy an exciting Match Play League, and participate in the LPGA Amateur Golf Association Championships and the Cal Cup. Don't worry about your score - all players are welcome, from beginners to experts! We offer weekend golf events and weekly leagues geared to all levels of play and demanding schedules. We also offer outstanding golf educational and social networking opportunities. Check out our website and join us! We welcome guests considering membership in our chapter as well as visiting Members from other LPGA Amateur Golf Association chapters to join us at our events and activities. Check out our Upcoming Events list and feel free to contact us anytime! LPGA Amateur Golf Association is a 501(c)3 registered non-profit organization. Learn more by visiting the LPGA Amateur Golf Association Headquarters website at http://lpgaamateurs.com/. Click here to join LPGA Amateur Golf Association. Registration is closed and play is underway. This is a fun, casual winter league that is played in January and February. If you missed signing up, you may be able to join the group as FUN play by contacting Karen Zamarripa to see is there is space available after the field. The Stableford League is a fun, individual stroke play format. Players earn points for each hole based on their net scores making this a perfect league for players with higher handicaps. The objective is to earn as many points as you can. The league runs from June 15 to August 25, 2019. Registration for the league will open in late April. The 2019 Camellia Cup Match Play League will open for registration in July. This league runs from September 14 to October 27. Coming Soon. (In the meantime, click on the event in the Calendar above to go to the activity landing page). Individual sponsor information coming soon. (Click sponsor links on right hand side to find out more about each sponsor).